Food is one of the main ingredients when trying to partner up with someone. When the dating becomes something a bit more serious, those let’s-go-out-for-dinner-dates become come-over-my-place-I’ll-cook-for-you-dates. You cook for someone, or even better, you cook together, chatting together in the kitchen, having wine, feeling really excited because it’s all going so well. And then it gets even better: you discover that this guy has pretty decent knife skills and knows it’s best to clean as you go. When in the throes of serious but still kind of early dating, there’s cooking but not the type of cooking just to get by. The dishes have to have some fuss about them: there’s fancy stuff, ethnic stuff, fun stuff, exotic stuff, there’s dessert and multiple courses and themed dinners and menus copied out of cookbooks of famous chefs. 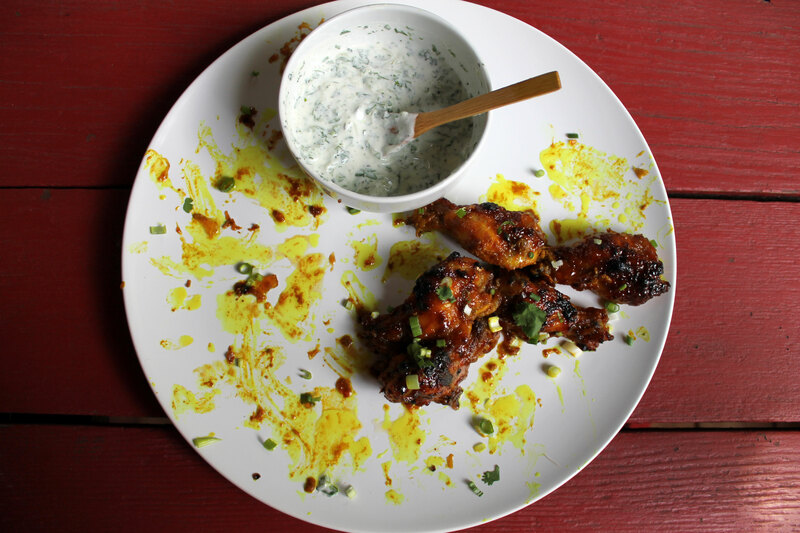 This curried chicken wing recipe was discovered when I started dating Orest. That was about 11 or 12 years ago. Looking at it now, it doesn’t seem that this recipe had enough fuss about it for me to want to make this for us. But back then this dish counted as exotic because it had curry powder in it (I’ve come a long way) and I had to figure out who this Major Grey is and why he makes chutney. And obviously, chicken wings are always a winner. Orest and I got married a few weeks ago. A wedding where we tried to keep it simple still ended up being so all consuming in the final month leading up to the event. But now that the party planning and organizational acrobatics are done, we’re back to the heart of it all – a happy relationship that endures. This recipe, like the relationship, has made it over a decade. Its original splotched print out is still in my recipe binder. To celebrate our marriage and to get back into the swing of writing on Food Anthology, I thought to write a wedding-ish post about cake or champagne or something else that obviously shouts celebration. But that didn’t feel right. I made this dish a few nights ago when it hit me that this dish is “it,” that celebratory wedding recipe I thought to write about. Here we are, sitting down at the table more than decade later with a dish we thought was a keeper way back at the beginning. That’s alliteration if I ever saw it. Adapted a bit from epicurious.com. In a bowl stir together the curry powder, 2 tablespoons of the chutney, 2 tablespoons of the lemon juice, cayenne, and salt. Add the wings and toss to coat them well. Let the wings marinate, covered and chilled for at least 4 hours or overnight. In a small bowl stir together the remaining 4 tablespoons chutney and the soy sauce. 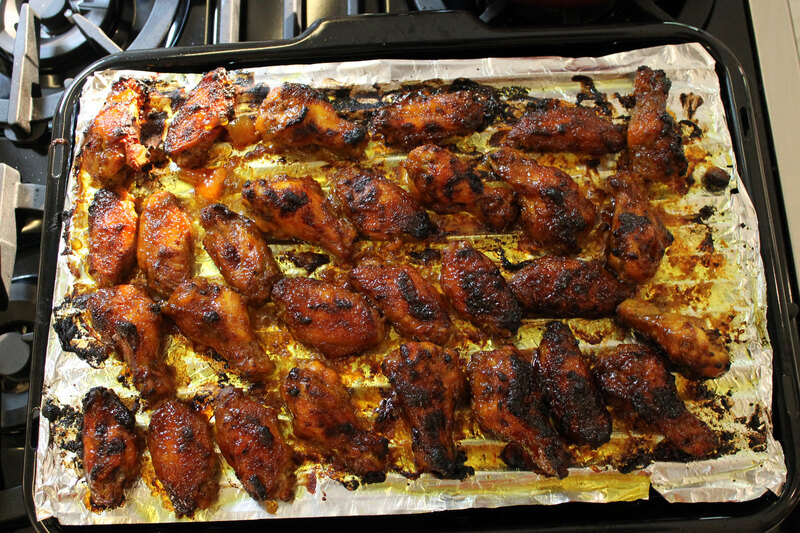 Arrange the wings, marinade discarded, on the oiled rack of a broiler pan*. Bake them for about 25 minutes. Brush the wings with the soy-sauce mixture and broil them under a preheated broiler about 4 inches from the heat for 1 to 2 minutes, or until they are crispy and dark caramel coloured and a bit burnt in places. To make the yogurt sauce, stir together the yogurt, cucumber, minced coriander, 1 teaspoon of lemon juice, and salt to taste. 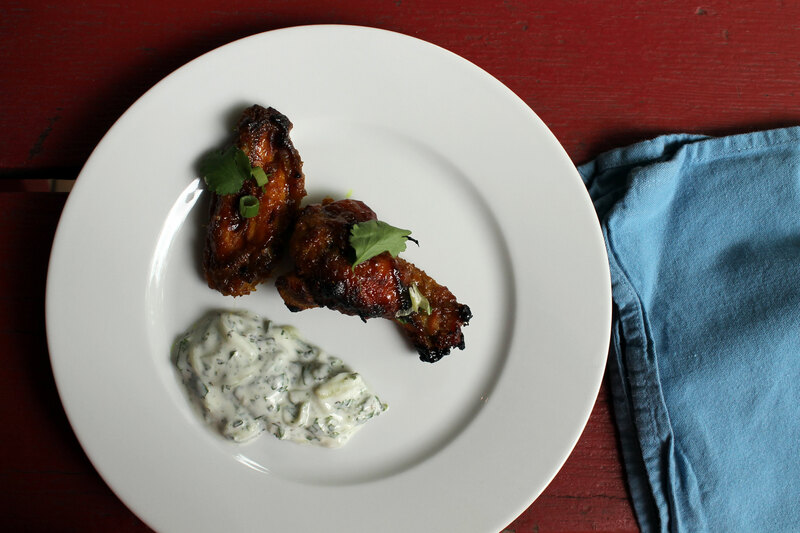 Transfer the wings to a platter, garnish them with the coriander sprigs and chopped green onion, and serve them warm or at room temperature with the yogurt sauce. 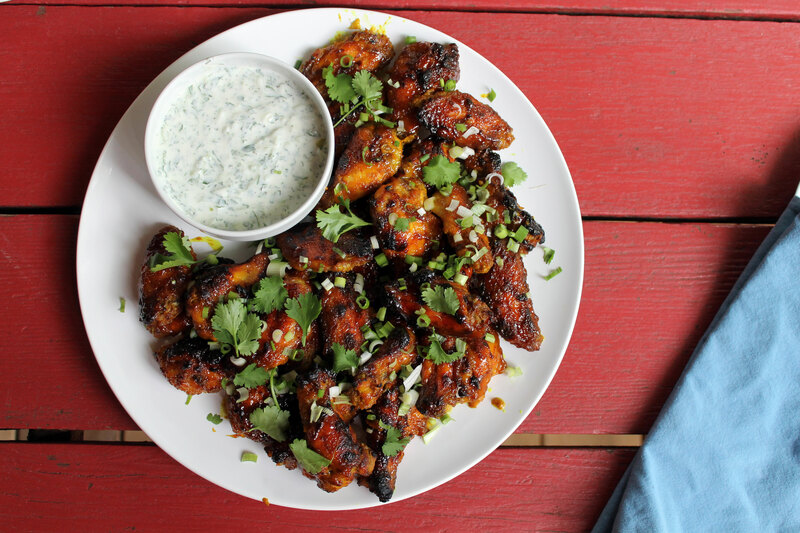 This a great party appetizer but it can also be a main dish if you love chicken wings (like I do). Makes enough for 2 as a main dish (with maybe a couple leftover). *broiling the wings with the chutney glaze can make for extremely tough cleaning of the rack, that chutney glaze becoming a shellac. If you’re not keen on soaking and scrubbing, you can line the rack with aluminum foil for easy clean up. However, during the baking time, you’ll need to flip the wings over so the underside can have contact with the hot air to crisp up the skin all around.